UN-CANCELED: Here’s where to watch from atop Capitol Hill. One Reel has spent the past nine months trying to raise money for the 4th of July tradition. Despite a major fundraising campaign in March, the group only received $55,000 in donations. Stone said everyone who made a contribution will get a refund. For several years, the Family 4th was sponsored by large corporations. That ended after the 2009 show when Chase Bank pulled out. In 2010, the show was almost canceled because of a lack of funding. A last-minute grassroots effort saved the event. But Stone says the only thing that could save the 2013 show is if a client or corporate sponsor comes forward to pay the entire bill. Stone said he doubts that will happen. 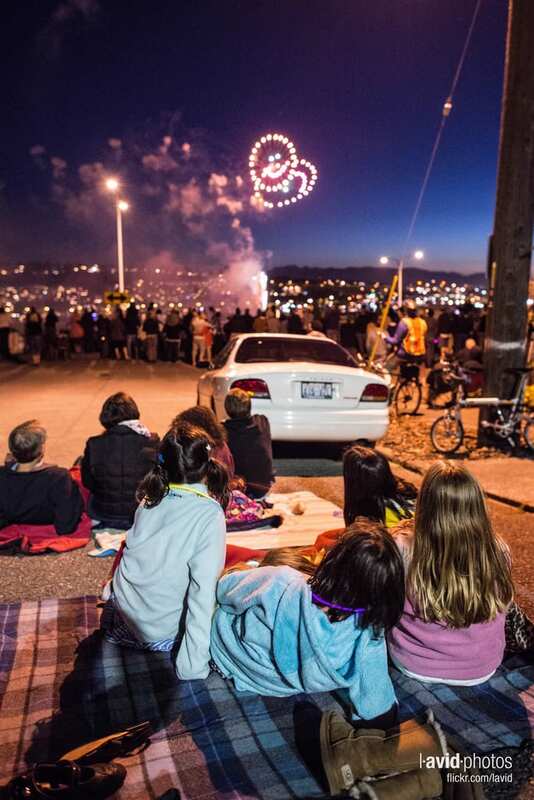 Lining the streets along the western edge of Capitol Hill to watch the fireworks show over the lake is a neighborhood tradition for the ares with a view of the action. You can see our pictures from 4th of July 2012 on Capitol Hill here. We’ll check in with the Capitol Hill Chamber of Commerce but last we heard, Cal Anderson’s annual Independence Day picnic — usually fireworks-free and, typically, not actually on July 4th — is happening again this year. Also, if you’re thinking about putting on your own pyrotechnics show in the streets of Capitol Hill, please think again. UPDATE: The Chamber confirms that the annual Cal Anderson picnic is a “go” for 2013 and will again be organized by the Cal Anderson Park Alliance. This entry was posted in Community, News, etc. and tagged economy, holidays by jseattle. Bookmark the permalink. Gee, it seems like we get an announcement like this almost every year, but then someone steps in to make the show happen. I’m guessing that will happen again this year. I believe this year the window of time to secure permitting has passed so even if someone or some company stepped up to fund it, it’s too late. I also heard no Blue Angels this year either. Outside of the rapid construction, it should be a quiet summer on the hill, I guess. I wish! But I read that Seafair is contracting with some private air-show to replace the Blue Angels. Yup, and it will be just as loud, noisy, and annoying as the Blue Angels. Good riddance. I like fireworks and all, but this year after year of asking for money to pay for it is ridiculous. One Reel might be the worst run company in this city. Pingback: How Will We Celebrate The 4th Of July In Seattle? | Yow Yow!